You’ll Be Glad to Know What Possums Eat! At night, when you catch sight of an opossum in your car headlights, you are allowed to think, “That is one ugly little animal.” But what opossums lack in looks, they make up in originality. They’re America’s only babies-in-the pouch marsupial. They’re a southern species — proper name Virginia opossum — that’s adapted to New England winters. They’re one of the oldest species of mammal around, having waddled past dinosaurs. They eat grubs and insects and even mice, working over the environment like little vacuum cleaners. 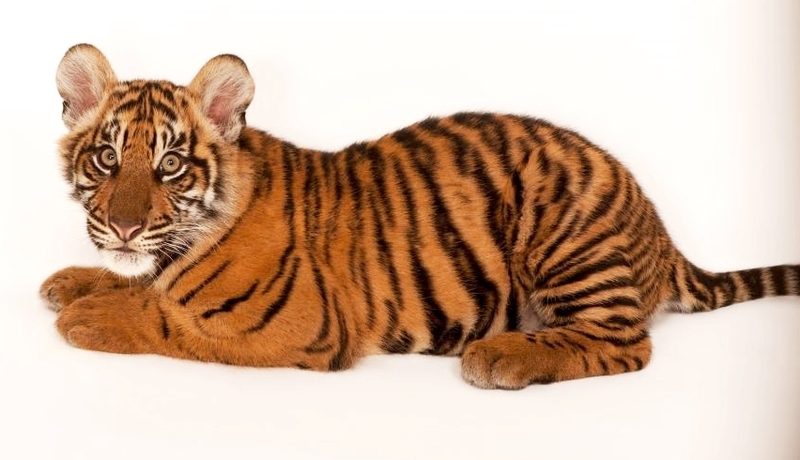 “They really eat whatever they find,” said Laura Simon, wildlife ecologist with the U.S. Humane Society. “They are just interesting critters,” said Mark Clavette, a wildlife biologist with the state Department of Energy and Environmental Protection. And now ecologists have learned something else about opossums. They’re a sort of magnet when it comes to riding the world of black-legged ticks, which spread Lyme disease. Several years ago, scientists decided to learn about the part different mammals play in the spread of the ticks and the disease. They tested six species — white-footed mice, chipmunks, squirrels, opossums and veerys and catbirds — by capturing and caging them, and then exposing each test subject to 100 ticks. What they found, is that of the six, the opossums were remarkably good at getting rid of the ticks — much more so that any of the others. “I had no suspicion they’d be such efficient tick-killing animals,” Ostfeld said. Extrapolating from their findings, Ostfeld said, the team estimated that in one season, an opossum can kill about 5,000 ticks. What ecologists are learning is how complex the interaction of ticks and mammals can be. For example, foxes probably serve as a host for ticks seeking a blood meal. 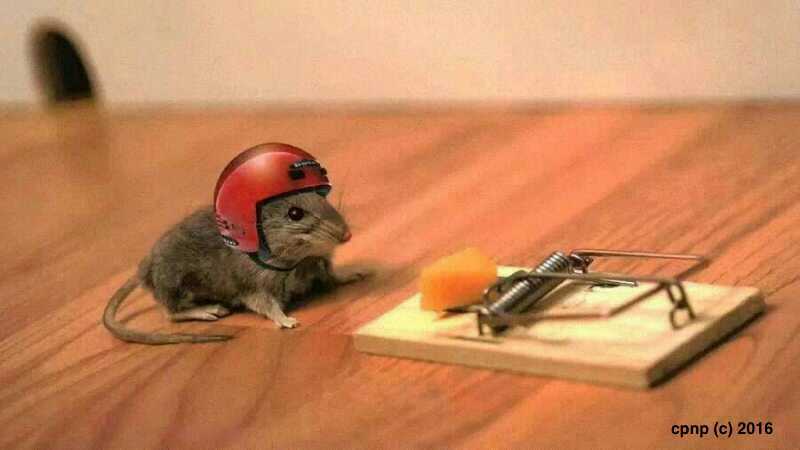 But foxes are great at killing white-footed mice — the species in the environment credited with being the chief reservoir of the Lyme bacteria. 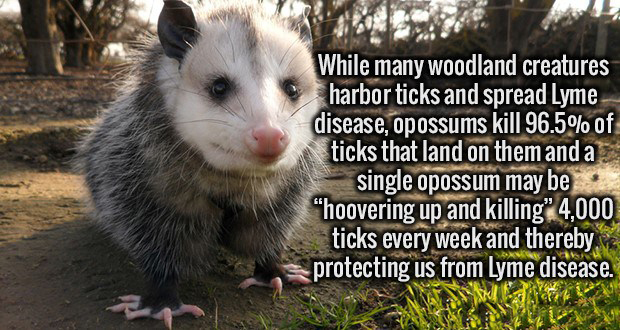 Likewise, Ostfeld said, opossums, waddling around at night, pick up lots of ticks. Some ticks end up getting their blood meal from the possum. But more than 90 percent of them ended up being groomed away and swallowed. For Simon, of the U.S. Humane Society, the Cary Institute research is a welcome justification to just leave opossums be. “People are so hard on them,” she said. That’s in part because people think oppossums might be rabid when they drool and hiss and carry on when threatened. In fact, opossums are resistant to rabies. Meanwhile, they are not particularly pretty. People who “ooh” and “aah” over fawns and bluebirds may not extend the same love to pokey animals with triangular heads, white faces and naked tails. “I tell people ‘We can’t all be beautiful,’ ” Simon said. What Happens When a Chameleon Looks in a Mirror? And if she sees herself in a mirror? It would likely be more subtle than the male reaction, Hughes says—although there isn’t enough knowledge of female chameleons to know for sure. “Male chameleons will, in most cases, immediately change colors in response to seeing another male, and in this instance, to itself in a mirror,” says Daniel F. Hughes, a doctoral candidate in Greenbaum’s lab. (Related: “What Do Animals See in the Mirror?“). 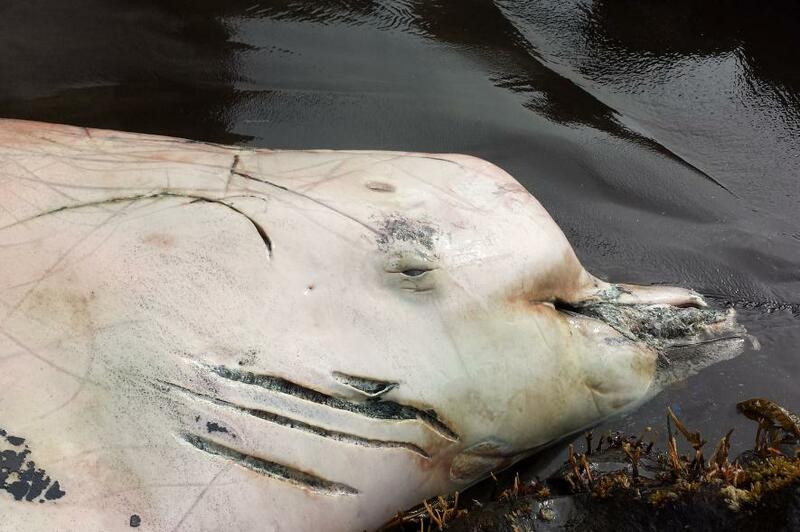 This whale washed up dead on Alaska’s St. George Island in June 2014. Scientists say it is a newly discovered species of beaked whale. It’s just so exciting to think that in 2016 we’re still discovering things in our world—even mammals that are more than 20 feet long. It turns out, according to new research published Tuesday, that this was not a Baird’s beaked whale at all, but an entirely new species—a smaller, odd-shaped black cetacean that Japanese fishermen have long called karasu, or raven. Channel Islands National Park is a popular day trip from Los Angeles; hundreds of thousands of people make the venture every year. But the eight-island chain, dubbed the Galapagos of the North, still holds plenty of mysteries. In fact, during a recent trip to map the surrounding waters, the team aborad the Nautilus exploration vessel found a strange bright purple ball that looks like an unhatched Pokémon. … The team used a vacuum system to slurp up the creature. Once aboard the ship, it began to unfold into two distinct lobes and looked like it could be a new species of nudibranch, according to the team’s website. Known for their brilliant hues, nudibranchs are a type of sea slug that inhabit a range of environments. The orb wasn’t the only awesome find from the trip. While surveying deep reefs in the Sanctuary to identify “essential fish habitats,” the Nautilus crew also found whelks building their unusual egg towers, groups of Pacific octopuses protecting their eggs, as well as interesting corals, sea stars and sea fans. There are likely many more creatures to discover in this region. Less than half of the sea floor has been mapped within the Channel Islands National Marine Sanctuary, which encompass 1,470 square miles of water around the islands. The Nautilus Exploration Program plans to peer into more of these nooks and crannies, mapping the area and collecting biological samples along their route. The goal is to pay particular attention to the deep sea habitat and deep coral beds in the area. 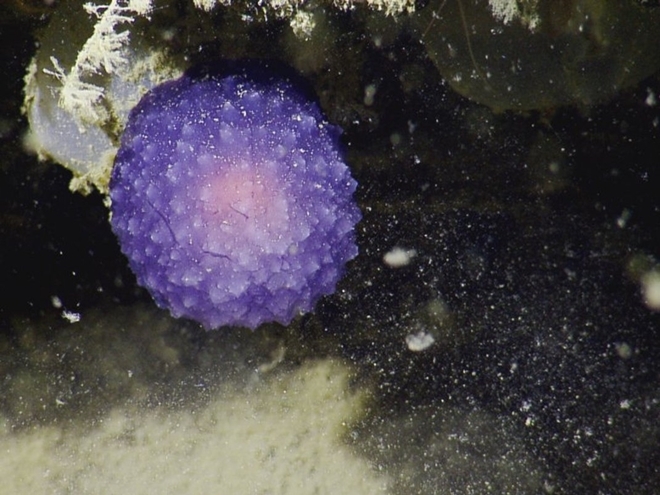 The purple blob was found on their latest venture, which took place July 3 to July 21. It may be a while before scientists figure out what the odd spiky orb truly is. But in the meantime, there’s so much more to find lurking in the ocean depths.